iOS 12.2 features new Animoji character icons for compatible iOS devices, support for a new Apple News Plus paid subscription service, and resolutions to various bugs and issues. The full release notes accompanying the iOS 12.2 download are further below for those interested. Separately, Apple has updated other system software as well with a simultaneous release of tvOS 12.2 for Apple TV, MacOS Mojave 10.14.4 update for Mac along with Security Update 2019-002 for High Sierra and Sierra, and an update to watchOS for Apple Watch. 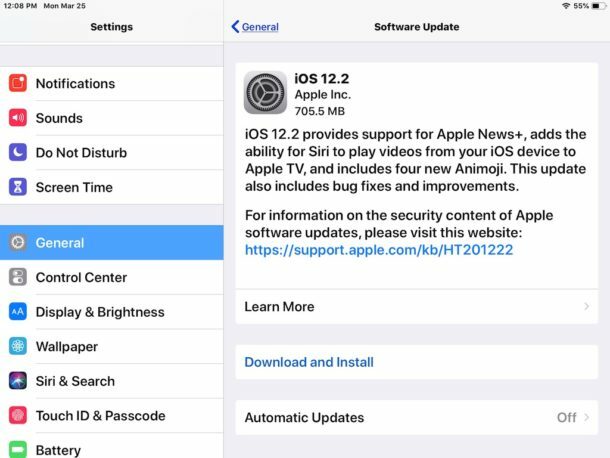 The simplest method of updating to iOS 12.2 on an iPhone or iPad is from Software Update within the Settings application. Before anything else, backup the iPhone or iPad to iCloud or iTunes before starting the iOS update, this allows you to restore data in the odd event something goes wrong. Installing iOS 12.2 requires an internet connection and the battery of the iPhone or iPad must be sufficiently charged, or the device must be plugged into a power source. The iPhone or iPad will reboot automatically to complete installation. If you have automatic iOS updates enabled than iOS 12.2 will install on its own when the device is not in use. 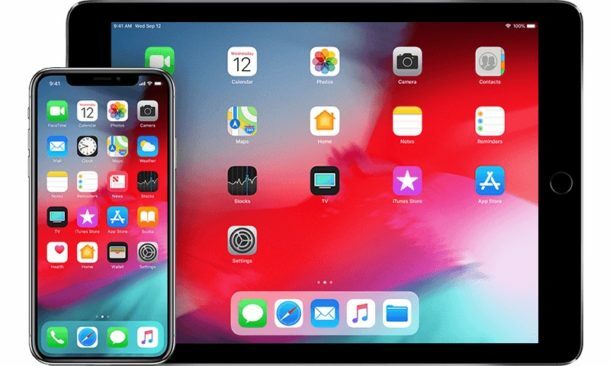 Users can also choose to install iOS 12.2 through iTunes on Mac OS or Windows by connecting the iPhone or iPad to a computer running the latest version of iTunes. Selecting the device within iTunes and choosing ‘Update’ (after backing up, of course!) will install the update this way. Another option which is generally most appropriate for advanced users is using IPSW firmware files for installing iOS updates. This method requires iTunes and a USB cable as well. Aside from iOS 12.2 updates, other system software updates are available for other Apple products, including MacOS Mojave 10.14.4 for Mac, Security Update 2019-002 for MacOS High Sierra and Sierra, tvOS 12.2 for Apple TV, and watchOS 5.3 for Apple Watch. Thanks for sharing your great tips with interesting Update, hope they’ll make our PC’s more secured! we have here only storm ⛈! Same thing I am experiencing, it takes forever to download. After 12.2 update on an iPad Pro, notifications stopped working. I’m still searching for a fix.